As a company Volcanic is committed to innovation, Over the years we have been building a large amount of new functionality that very much puts our platform ahead in the global market. Today we have launched a new platform that both contains all the great features we've always had but also allows us to introduce even more capability and insight that our customers will really appreciate. Being a cloud based service, this means that all our customers get to experience the product improvement as part of their monthly package. As well as the new layout and new exciting features the system continues to support all mobile devices. We've made it easier for our customers to find the tasks they need to do, by splitting the dashboard area into three seperate sections. 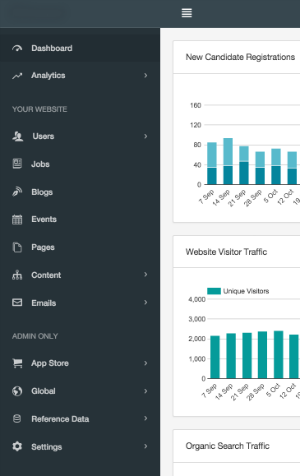 The Dashboard and Analytics area lets customers see how their site is performing. The Your Website section is the area where you undertake common tasks like, writing blogs, loading jobs, creating pages, preparing emails etc. The Admin Only Area is the section where you set-up the critical parts of the site, like disciplines, Apps like Broadbean etc. It's not used everyday and can be restricted to only certain members of the team. All these changes are designed to make the system easier to use and also allow Volcanic to release more features and provide more insight into your candidate attraction tool. So finally, the system doesn't need our customers to do anything, We are not looking for you to pay upgrade fees, there's no annoying down time and there's no impact on your IT, just carry on using the same modern browsers you've always used to manage you system.